Last week's post about How to Get Ahead at Work had six great tips to help your career - number six was "Reframe Failure...Reflect on the lesson the failure offers, making adjustments accordingly, then climb back on your horse!" That's pretty difficult to follow through with. The good news is, we all can recover. And we all can get better. This article has one amazingly great tip to help you acknowledge, work through and learn from your mistakes: Make a mistake list. Here's how it works. I used to hide from my mistakes as if recognizing them was an acknowledgement of fundamental, irreversible flaws. Then I decided that's a stupid way to view the world. That's when I started my To D'oh! list. We all make mistakes. Some of them are minor things. Others are catastrophic and massive in scale. Others still are weird, repeating quirks that need acknowledgement and repetition before they can go away. It's easy to say to yourself, "I've made a mistake, I won't do it again." It's harder to write it out and face it nearly every day. 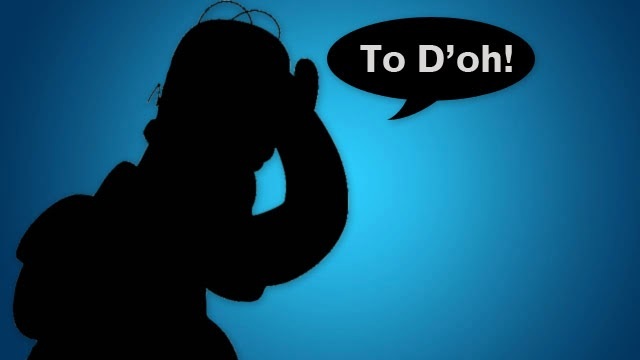 For me, the To D'oh! list was born out of the need to keep my mistakes here at Lifehacker in order. It initially started as a text file called "Thorin's List of Troublesome Words" and included my most common mistakes with tense, headline capitalization, and other things. Thorin's List of Troublesome Words: As mentioned above, this is where I write down my common grammar mistakes, misuse, and other writing-related things. Work D'oh's: Here I'll dump ideas that didn't seem to go anywhere, failed post ideas, times I should have asked for help, and any workflow related issues I run into. Project D'oh's: This is my failure bin for various DIY projects. It includes mistakes from projects—usually regarding my misuse of power tools or materials. Life D'oh's: These are the general d'oh's, ranging from getting lost when blindly following GPS directions to considerably stupider things I won't bore you with. I'll also toss in embarrassing moments in public so I can look back and see why I was embarrassed. Delayed Response File: You know those moments, fifteen minutes after you have a conversation, where you come up with a better response to something someone said? I put those responses here. Like most people, I have always recognized my mistakes, and I've certainly tried to take useful lessons from them. However, it wasn't until I really looked at them directly that I began to notice themes, and I began to really work on them. This isn't a new idea by any means, but the act of writing down mistakes has stopped me from making the same ones twice. In some cases, the corrections are mostly subconscious. My list of troublesome words, for instance, has mostly been eradicated (although more always get added in). My behavior has changed too. I'll often spend a bit more time reflecting on things. I often return to the To D'oh! text in my brain when I'm in similar situations so I can backtrack, and not repeat a mistake. In the end, my To D'oh list is a collection of everything I've learned, not every mistake I've made. The list is filled with both causes, and effects. When need be, it's a place to find inspiration for how to do things differently. I'm not going to stop making mistakes, but at least they'll be new ones.